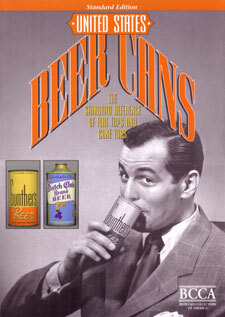 Publisher: Beer Can Collectors of America, 2001. Hard Cover, 247 pages, 9.25 x 12.25. United States Beer Cans, the brainchild of the Beer Can Collectors of America®, is simply the most complete, most colorful, most information-packed guide to flat-top and cone-top beer cans that the hobby has ever seen. It is an indispensable tool for cataloging and building a collection -- which makes United States Beer Cans the one book every beer can collector, serious or casual, needs to own.